From 2014-2016, the Joseph Branch Trail Consortium, Eastern Oregon University, Oregon State Parks, and Northeast Oregon Economic Development District conducted a series of public outreach meetings in each of the communities the Joseph Branch Community Rail with Trail would pass through. These meetings, along with adjacent landowner outreach, private interviews, and site visits, provided the public input which guided the Concept Study and now the development of the first 6 miles of the trail. In addition to the public outreach meetings, three public opinion surveys have assessed local opinion about the building of the 63-mile recreational trail along the rail line from Elgin to Joseph. The full survey results (references below) should be consulted for additional detail. 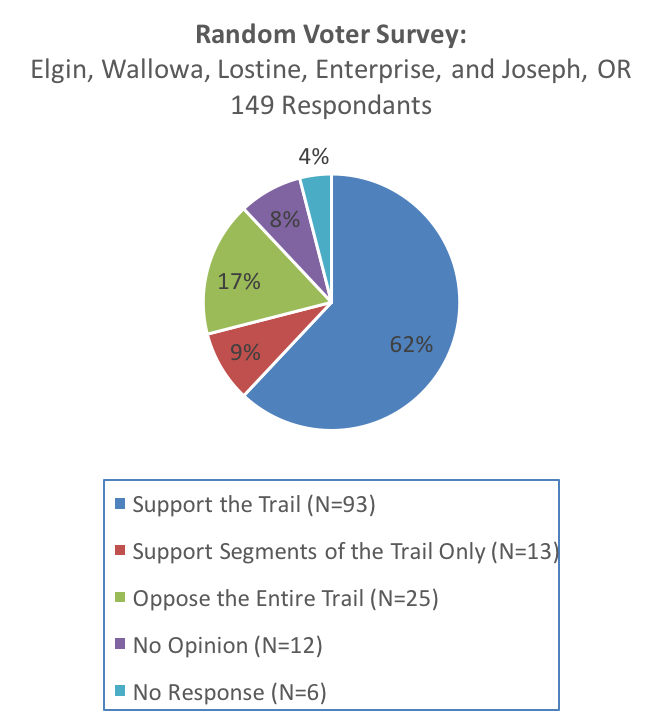 In summary, a substantial majority of respondents to three surveys directed to different groups support the development of the trail from Elgin to Joseph, or of certain trail segments. Opposition appears greatest among those living adjacent to the proposed trail. Surveys by definition often suffer from low response rates and a selection bias toward survey completion by the most extreme elements. These limitations notwithstanding, there appears to be a broad and consistent positive opinion regarding the proposed Joseph Line Branch Trail by the majority of respondents. Background: Surveys 1 and 2 included identical questions and were developed and administered by faculty and students at Eastern Oregon University on behalf of the Wallowa Union Railroad Authority (WURA). The 18 question survey was developed after extensive personal interviews with local stakeholders to identify their opinions and concerns. Survey 1 targeted a random sample of voters living in proximity to the proposed trail, and Survey 2 targeted a broader audience of interested individuals. Both surveys were conducted from April 14 to June 17, 2015. 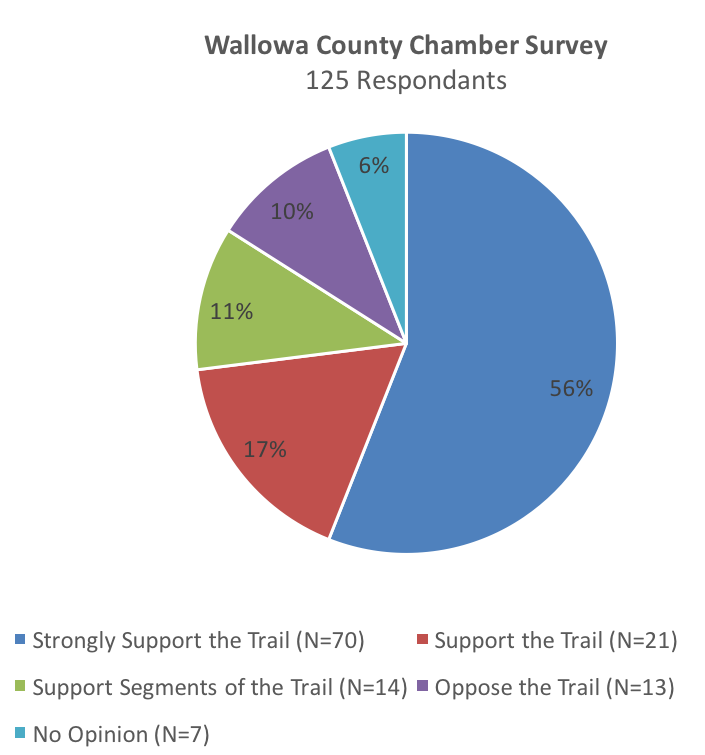 Survey 3 assessed the attitudes and opinions of members of the Wallowa County Chamber of Commerce toward development of the proposed trail. All registered voters in Union and Wallowa Counties living in the Elgin, Wallowa, Lostine, Enterprise, and Joseph zip codes were identified and 550 voters were randomly selected to receive the survey; 149 surveys were returned (27%). Overall 62% of respondents support building the entire trail and an additional 9% support building only certain trail segments. Seventeen percent of voters oppose the entire trail. Support was lowest in the group of residents immediately adjacent to the trail (20%); support increased to approximately 70% for people living between 1 and 10 miles from the trail. An open survey collected voluntary information from those who attended project workshops, meetings, and offered comments about the trail through the project website (www.eou.edu/rails-with-trails) or other means, and anyone else with an interest in the trail. The questionnaire was also advertised through various social media, the Wallowa County Chieftain, and the La Grande Observer. These survey respondents were not limited by location or residency; this survey was an attempt to give anyone with an interest an opportunity to comments so as to better understand the broader opinions of the community. Three hundred and forty seven completed questionnaires were received; 85% supported development of the entire trail, 7% supported building only certain trail segments and 7% opposed the entire trail. Of 44 landowners adjacent to the trail, 57% supported development of the entire trail; support increased to 88% - 90% for people living between 1 and 10 miles from the trail. Survey 3 was administered by the Wallowa County Chamber of Commerce in September 2016; the target audience was its membership. Members were asked “To what extent is your level of support for the Joseph Branch Rails with Trail Project?”. In a membership of approximately 350, 125 respondents, 73% indicated “Strong support (56%)” or “Support (17%)” for the entire trail. 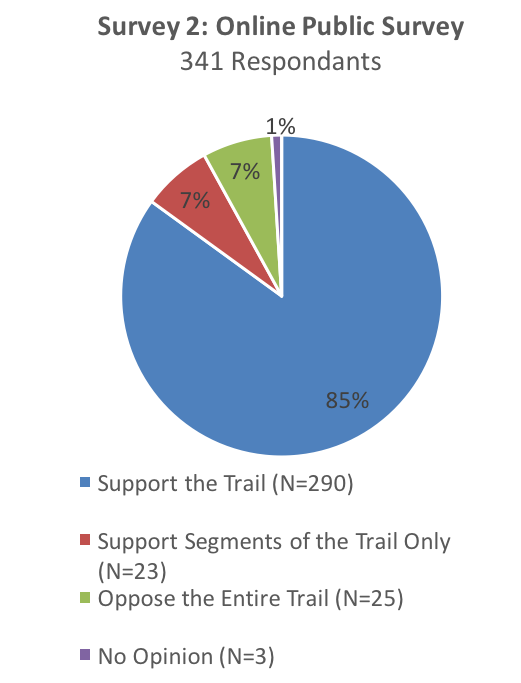 An additional 11% supported segments of the trail and 10% opposed the trail. Joseph Branch Trail Consortium (JBTC) is a grassroots non-profit in Wallowa & Union Counties made up of voices from the medical, equestrian, bicycling, hiking, Nez Perce Trails Foundation, and other communities whose mission is to assist in the development of a viable multi-use trail for the Wallowa Union railroad corridor. By donating now, you can help the JBTC as we work to make this trail a reality. All donations are 100% tax deductible . Click the button above to join the Joseph Branch Trail Consortium and help build the trail. Thanks! Thank you for signing up for our newsletter. Watch your inbox for our quarterly newsletter. Copyright 2019 Joseph Branch Trail Consortium. All rights reserved.